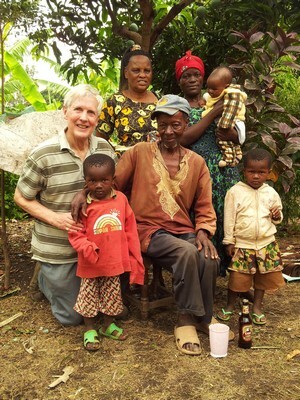 Our CEO continued his visit to Tanzania, shifting his focus to our second wide area of operations, Moshi. If you’ve missed the earlier blogs, catch up on Part 1 , Part 2 and Part 3. We left early from Arusha to start a two day visit to Moshi, our largest centre of grant recipients. First stop was Boma N’gombe where we embarked upon a two mile hike into the hinterland with our local manager, Mama Glory. Boma N’gombe is actually the busiest of all our grant locations. Its thriving market on the slopes of Mount Kilimanjaro is the biggest in the region. 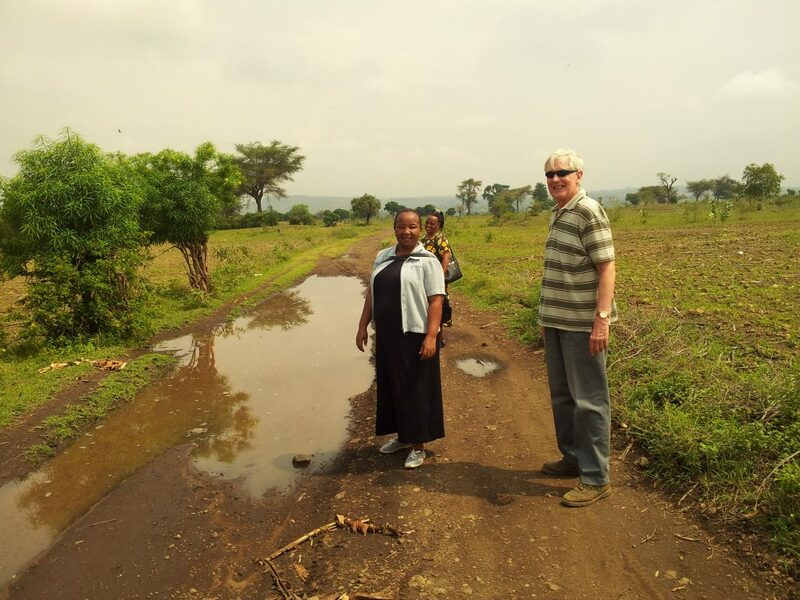 However, it is surrounded by farmland and our first visit was to Hilda’s shamba (kiswahili for a small farm). Hilda is 44 and was widowed four years ago. She started with an £80 grant from Mondo to grow and sell mangoes and has twenty large trees providing a fulsome harvest. 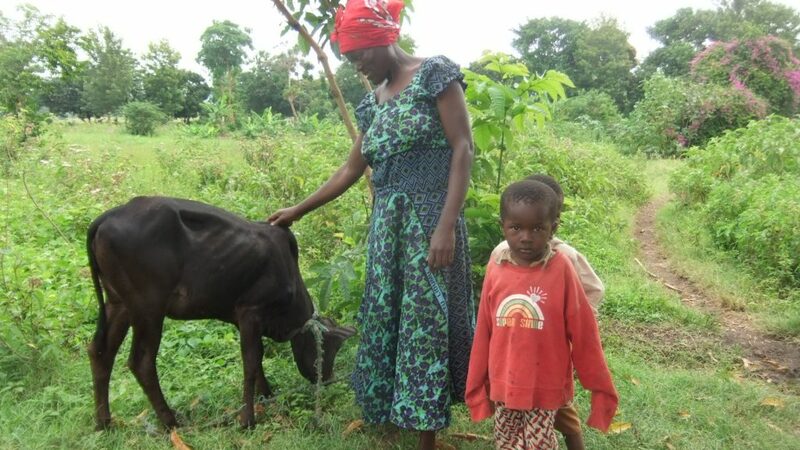 Two years ago, she took out a loan to buy a cow. Using a local breed, tough and resilient to disease, it has enabled her to feed her family with good milk. The original cow had two calves, one of which she sold. The two remaining cows, mother and daughter, have again calved and so a steady stream of income is being produced. Recently she took out a second loan of £200 to buy pigs and now has three of them, all awaiting piglets! Hilda looks after her elderly father and three children. The family are in good health, and Hilda has created a secure livelihood. She employs a full time worker to help with the animals and a part timer to collect mangoes and take them into Boma N’gombe market. All in all, a most impressive story and a most impressive lady! And yet again, a reminder of why this programme is so powerful; How else could one help a widow and her four dependents to create a sustainable livelihood with such modest investment? Back in the centre of Boma, we visited a number of our recipients running stalls in the market. Zulea runs a vegetable business. Although having to travel an hour each way from her home, Zulea prefers this market to others as it is by far the busiest in the region. She specialises in Bhindi Bhaji and green vegetables that are healthy and much in demand by diabetes sufferers (a common affliction in Tanzania). Her range varies according to the growing seasons. Her sister helps when needed and Zulea is happy that her two small children are doing well at school and that her business enables them to be well fed. Plans for the future include setting up a permanent stall in the market for which she will request a loan of around £170. Zulea says that since she started this business, not only are the children eating better, but she can pay for medicines when she is ill. She used to be ill a lot but now she feels much better and faces each day with happiness, knowing her small business is helping all the family. Also busy in the market was 43-year-old Line. She sells soaps and cooking oil, decanted in empty Sprite bottles! Line had a grant of £80 two years ago and has stalls in the Boma market as well as another smaller one further away. Our Community Counsellor, Mama Mtei, looks after the 85 women we have provided funding to in this area and she is a power of strength. Her full time job is as a nurse at the hospital but she spends four days a month mentoring and encouraging the recipients on her “patch”. She runs her own chicken breeding business so has good hands-on experience. This was the sixth time I had visited her over the years and she hasn’t changed! Her energy is phenomenal and she is revered by her flock of recipients. She says she will retire from the hospital next year, but hopefully not from our job! We spent the night in Moshi and discovered the old station that was built as part of the Mwanza to Tanga Usambara railway before the First World War. The line was essentially for goods traffic and trains operated several times a week into the 1960s, taking coffee to the coast. This all ended in the 1970s and the lovely old colonial station and platforms are now rotting away. Just a few rusty carriages are all that is left of what was clearly a major hub. But the track remains in many places and what fun it would have been to ride one of those small hand propelled wagons you see in the old films!